[SOLUTION] How to give a user access to Integration Services in production without Administrator level access to the server? How to give a user access to Integration Services in production without Administrator level access to the server? I need to give a user access to SSIS Integration Services so they can deploy packages. However they cannot have access to the Administrator group on the Server. Is there a way to give a programmer (user) access to SQL Server Integration Services without making them an administrator on the server? 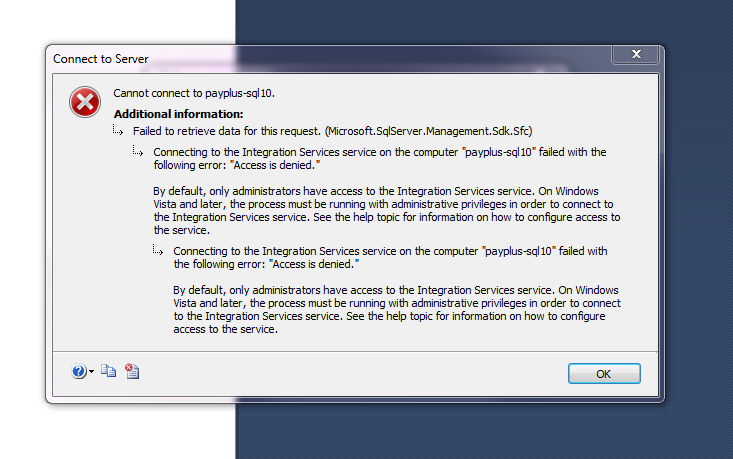 The error message they get is 'BY DEFAULT only administrators have access to Integration Services service. Access is denied.' ---- This implies there's a way to do this. I've already given the user access to MSDB database with the role db_ssisadmin. DCOM User Group Membership and DCOM Component Permission solved it!